Mr. Promoth Manghat, Chief Executive Officer of UAE Exchange group of Companies spearheads the company with an impressive growth extended to 31 countries across five continents serving a customer base over 13.2 million at 800 direct offices. Be it satiating customers or happy workforce or trustworthy innovations or quintessential pecuniary solutions, Mr. Promoth perfectly personifies in its real essence. Similar traits have been seen to be percolated down the lane by more than 9000 employees from 40 countries. He is looked upon from all quarters for his excellent trait to mentor large in-house crowd, initiator of new processes, and verticals. Regulatory compliance also witnessed further fortified with rigorous risk combating strategies with whistle-blower mechanism, thus establishing the goodwill of the company among the regulatory bodies. Mr. Promoth has also led the team that devised the risk and compliance strategy, which strengthened the global compliance of the organization, building its goodwill among regulators from across countries, where it has operations. He has also been at the helm of several key transitions at UAE Exchange in the last 10 years including restructuring, visioning and branding, which paved way for the transformation of UAE Exchange into a truly global brand. A voice respected and abreast of developments that transcends beyond the frontiers of learnt expertise. He always had an upper hand in using of Business Intelligence much before the term was coined. Mr.Promoth has a style of business insights that stands out from the rest of the industry. He refers ‘race is against the tail’, the lurking revelation in the disruption of the conventional business etiquettes that is gradually seeping into the economies. Rather than a hawk’s eye on the immediate competitor, present era calls the need to upgrade by taking lessons from the growing sprouts of the industry. Each challenge is perceived as an opportunity, carving out tech-powered innovations, bringing resilience and sustainability to the trajectory of business. It is always his style to develop an entrepreneurial culture among the workforce developing employee partnership in all spheres of business. His success speaks for itself when we see his rise from irrevocable insights in the field of Infrastructure & Operation, enterprise architecture & technological innovation, security & risk, data & analytics, program & portfolio management and much more. His impeccable leadership skills has elevated the brand to highest standards across the globe. 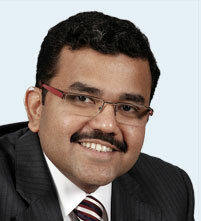 Mr.Promoth’s tenure in UAE Exchange began in April, 2001 when he joined UAE Exchange India as Manager – Accounts. He played a significant role in streamlining the Finance and Accounts function, process & system development and corporate planning of India Operations. In November 2003, Mr.Promoth was promoted to the post of Finance Manager of UAE Exchange, UAE. His experience, innovative thinking and team playing skills helped in streamlining processes of the global financial function of UAE Exchange. In 2005, Mr. Promoth was elevated to the position of Vice President – Operations of UAE Exchange which marked a new era in the history of UAE Exchange. The various projects and initiatives he undertook substantiated his skills and effectiveness in strategic and operational areas and UAE Exchange, during this period, achieved outstanding success transforming itself into a global remittance and foreign exchange brand. In September 2009, Mr. Promoth became the Vice President – Global Operations of UAE Exchange, leading the Global Operations team of UAE Exchange, which included the Global Country Operations and various functions and departments at its Global Head Quarters in Abu Dhabi. Subsequently, in December 2014 Mr. Promoth was elevated as the Dy. Chief Executive Officer and today is the Chief Executive Officer of the UAE Exchange Group of Companies. Along with its day-to-day operations, Mr. Promoth is responsible for strategy, operations and business expansion of UAE Exchange globally. He successfully leads a big team of Regional/Country Heads and the heads of Revenue, Strategy, Marketing, Risk, Products and Services Divisions at Global Head Quarters of UAE Exchange. Mr. Promoth represents UAE Exchange in several forums. His penchant for excellence has cascaded well down to the last link in the organisational structure. The result is that under his able leadership UAE Exchange earned coveted recognition from various quarters including ISO 9001 & 14001 certification, Superbrand status in 2009, 2010, 2011,2012, 2013, 2014 and 2015 consecutively, TISSE 2012 certification, Banker Middle East Product Award, Deutsche Bank & Standard Chartered Bank STP Excellence Award, Customer Service Week Star Award for 2010, 2011 and 2012, consecutively, Dubai Quality Award, The Sheikh Khalifa Excellence Award, Sheikh Mohammed bin Rashid Al Makhtoum Business Award, Dubai Service Excellence Scheme Award, Banker Middle East Product Award, Asia’s Most Promising Brand Award etc. Mr. Promoth’s strategic, negotiation and problem solving skills came to the fore to shine brighter during the acquisition of Travelex. The complexity of the deal can be measured by the number of regulators who needed to be satisfied before completion of the deal. The efforts won the team, led by Mr. Promoth, the ‘Deals of the Year Award’ from The Banker Magazine in the Mergers and Acquisitions category for 2015. He was conferred the prestigious Excellence in Finance & Profession Award instituted by the Institute of Chartered Accountants of India (ICAI), Abu Dhabi Chapter in 2015. Mr. Promoth is an Associate member of the Institute of Chartered Accountants of India since 2000 and holds a Bachelor’s Degree in Commerce. He was awarded Finance CEO of the Year Award at the Indian CEO’s Awards by ITP Group in 2016.